Figure 2-1. Close-up (1:1) view of stable machining. It is not absolutely necessary to understand the operating principles of EDM to be a successful machinist. However, an understanding of what is taking place between the electrode and the workpiece can aid the EDMer in several important areas. A basic knowledge of EDM theory can help with troubleshooting, in selecting the proper workmetal/electrode combinations, and in understanding why what is good for one job is not always good for the next. The following description represents a combination of what is known plus what is theorized about the process. While several theories of how EDM works have been advanced over the years, most of the evidence supports the thermoelectric model. Thermoelectric means heat and electricity acting together. The following nine illustrations show step-by-step what is believed to happen during a single EDM cycle. The graphs below the illustrations show the relative values of voltage and current at the point depicted. Illustration 1— A charged electrode is brought near the workpiece. Between them is an insulating oil, known in EDM as dielectric fluid. Even though a dielectric fluid is a good insulator, a large enough electrical potential can cause the fluid to break down into ionic (charged) fragments, allowing an electrical current to pass from electrode to workpiece. The presence of graphite and metallic particles suspended in the fluid can aid this electrical transfer in two ways: the particles (electrical conductors) aid in ionizing the dielectric oil and can carry the charge directly; and the particles can catalyze the electrical breakdown of the fluid. The electrical field is strongest at the point where the distance between the electrode and workpiece is least, such as the high point shown. The graph in the illustration shows that the potential (voltage) is increasing, but current is zero. Illustration 2 — As the number of ionic (charged) particles increases, the insulating properties of the dielectric fluid begin to decrease along a narrow channel centered in the strongest part of the field. Voltage has reached its peak, but current is still zero. Illustration 3 — A current is established as the fluid becomes less of an insulator. Voltage begins to decrease. 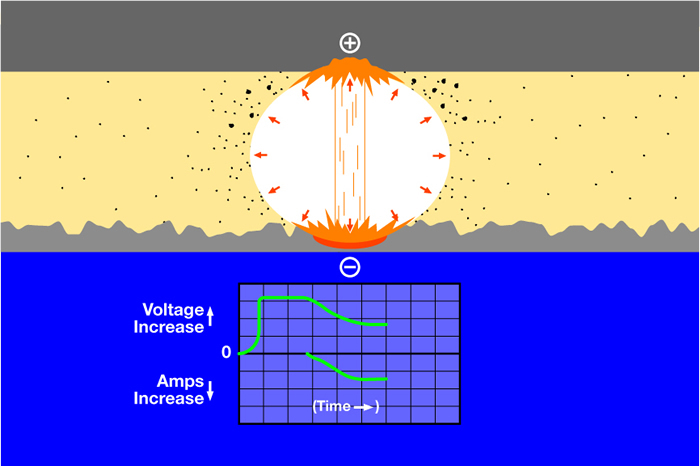 Illustration 4 — Heat builds up rapidly as current increases and the voltage continues to drop. The heat vaporizes some of the fluid, workpiece, and electrode, and a discharge channel begins to form between the electrode and workpiece. 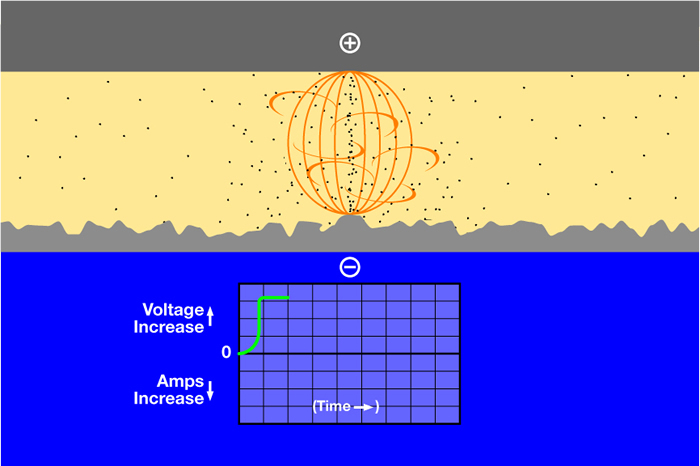 Illustration 5 — A vapor bubble tries to expand outward, but its expansion is limited by a rush of ions towards the discharge channel. These ions are attracted by the extremely intense electromagnetic field that has built up. Current continues to rise, voltage drops. Illustration 6 — Near the end of the on-time, current and voltage have stabilized, heat and pressure within the vapor bubble have reached their maximum, and some metal is being removed. The layer of metal directly under the discharge column is in a molten state, but is held in place by the pressure of the vapor bubble. The discharge channel now consists of a superheated plasma made up of vaporized metal, dielectric oil, and carbon with an intense current passing through it. Illustration 7 — At the beginning of the off-time, current and voltage drop to zero. The temperature decreases rapidly, collapsing the vapor bubble and causing the molten metal to be expelled from the workpiece. Illustration 8 — Fresh dielectric fluid rushes in, flushing the debris away and quenching the surface of the workpiece. 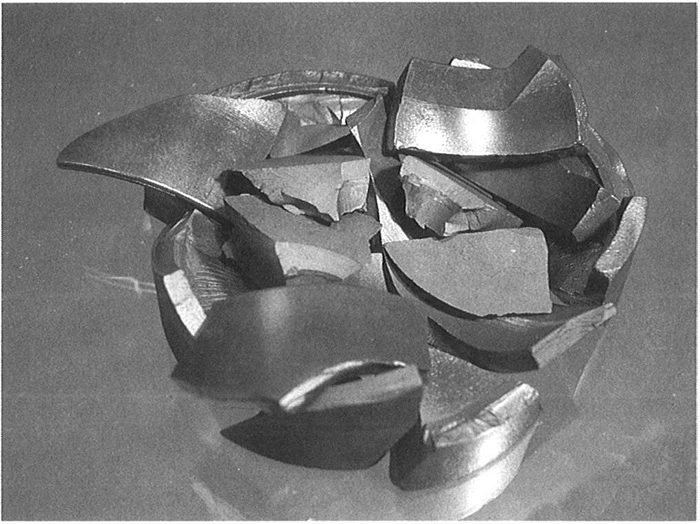 Unexpelled molten metal solidifies to form what is known as the recast layer. Illustration 9 — The expelled metal solidifies into tiny spheres dispersed in the dielectric oil along with bits of carbon from the electrode. The remaining vapor rises to the surface. Without a sufficient off-time, debris would collect making the spark unstable. This situation could create a DC arc which can damage the electrode and the workpiece. This on/off sequence represents one EDM cycle that can repeat up to 250,000 times per second. There can be only one cycle occurring at any given time. Once this cycle is understood we can start to control the duration and intensity of the on/off pulses to make EDM work for us. As the cut progresses through the workmetal a cavity starts to form. The deeper this cavity becomes, the harder it is for fresh dielectric fluid to get into the cavity to remove debris and quench the workpiece and electrode. 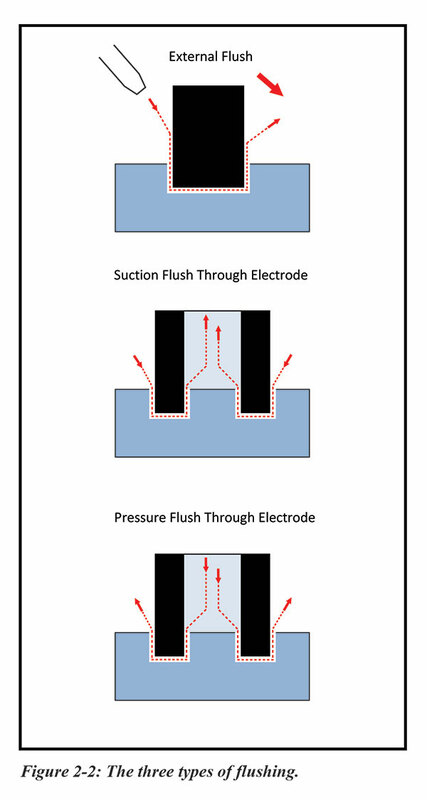 In order to get smooth, even flow of dielectric through the gap, flushing becomes an essential part of the EDM process. Good flushing allows the workpiece particles and eroded electrode particles to be removed from the gap. Flushing also allows fresh dielectric into the gap. Both are necessary to maintain stable cutting and to prevent arcing. It is the volume of oil moving through the gap that performs particle removal. Turbulence in the tank would indicate not enough volume and too much pressure. The ideal pressure is usually between 3 to 5 psi. Flushing at higher pressure may actually prevent the flow of particles out of the gap and the dielectric renewal in the gap. High pressure also tends to wear the electrode. The balance of volume and pressure is important. Roughing operations where the gap is large would require high volume and low pressure for good oil flow. Finishing operations where the gap is smaller may necessitate higher pressure to improve the oil flow. The three basic types of flushing are pressure, suction, and external (figure 2-2). The choice of flushing method may be limited by the application. The electrode shape and size may prohibit through the electrode flushing. Figure 2-2: The three types of flushing. This is the most common method of flushing. Pressure flushing forces the dielectric fluid through holes in the electrode into the gap between electrode and workpiece. Fluid and particles flow up the sides of the cavity. Pressure flushing through the electrode helps cool the electrode. A variation would be pressure flushing through holes in the workpiece. Secondary discharge along with mechanical abrasion from moving particles can cause tapering of the side walls and a nonuniform surface finish along the side walls. Suction (vacuum) flushing reduces side wall taper. Hot dielectric fluid moving out of the gap along the side walls can create a heat buildup. This heat can cause a slight thermal expansion of the cavity walls. This condition along with conductive particles moving up the sides of the cavity can result in secondary discharge. Since the spark will naturally seek the path of least resistance, it may discharge on the side of the electrode rather than the set gap at the end of the electrode. This is the opposite of pressure flushing. Fluid and particles are pulled out of the gap through holes in the electrode or workpiece. This method reduces secondary discharge and tapered walls. Nozzles or tubes may be used to direct streams of fluid into the gap opening. Fluid and particles are pushed out the opposite side. This is the least desirable method of flushing. Poor flushing conditions can trap particles which may cause DC arcing and pitting. Improved results are possible when the electrode is retracted in order to allow the cavity to be cleared of debris. This method slows the cutting process. Flush holes in the electrode mean that the workmetal will not be cut in these areas. A workpiece stump will remain in the cavity at the end of the cut. Depending on the depth of the cut, the EDM process will need to be stopped and the stump removed to maximize the benefits of flushing through the electrode. The remaining stump will have to be removed manually or with subsequent electrodes. The ability to orbit the electrode makes the flushing operation easier. 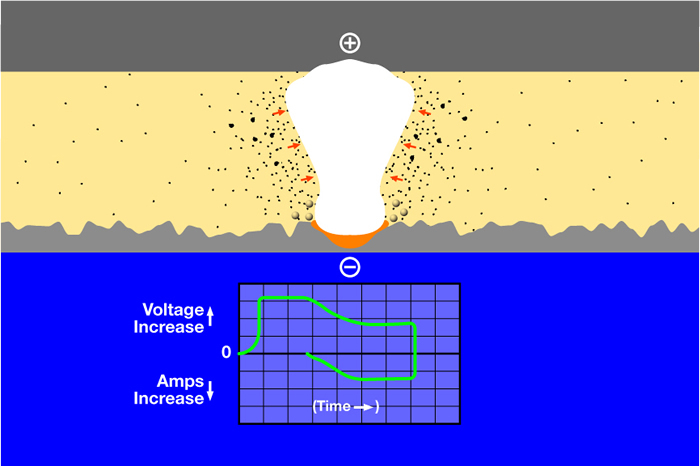 As the smaller electrode moves through its pattern, the gap will be larger on the away sides allowing particles and fluid to flow out of the cavity. The movement mechanically aids in the exchange of dielectric. Small flush holes in the electrode will not produce a stump if the orbit of the electrode is greater than the radius of the flush hole. Gas vapors produced by the spark action and trapped in blind cavities have been known to explode, much like the phenomenon of detonation in the cylinder of a gasoline engine. Such explosions can damage the electrode and workpiece, and pose a safety and fire hazard in the event of large buildups (figure 2-3). While automatic shutdown and temperature sensing of dielectric oil has significantly reduced the possibility of fire, it should be remembered that dielectric oil is flammable. If the creation of such pockets is foreseen during the design stage, provision for venting the trapped gas to the surface should be made. Figure 2-3. This was once an electrode. Unvented gases may be ignited by the EDM spark, destroying valuable electrodes, starting fires, or even causing injury. The finish that is created by the EDM process is the result of tiny craters being formed by the random impacts of thousands of sparks. After each cycle the rim of the created crater forms a new high point, making it a likely target for a new cycle. Due to this situation overlapping craters are formed, accounting for the random nature of the Electrical Discharge Machined surface. This Surface Finish (SF) is one of the attractive features of EDM in many industries. The EDM surface valleys and peaks formed by overlapping craters are measured with a profilometer and the surface finish is usually expressed in microinches by arithmetic average (µin Ra). The EDM process changes not only the surface of the workmetal, but also the subsurface. Three layers are created on top of the unaffected workmetal (figure 2-4). The spattered EDM surface layer is created when expelled molten metal and small amounts of electrode material form spheres and spatter the surface of the workmetal. This spattered material is easily removed. The next layer is the recast (white) layer. The action of EDMing has actually altered the workmetal's metallurgical structure and characteristics in the recast layer. This layer is formed by the unexpelled molten metal solidifying in the crater. 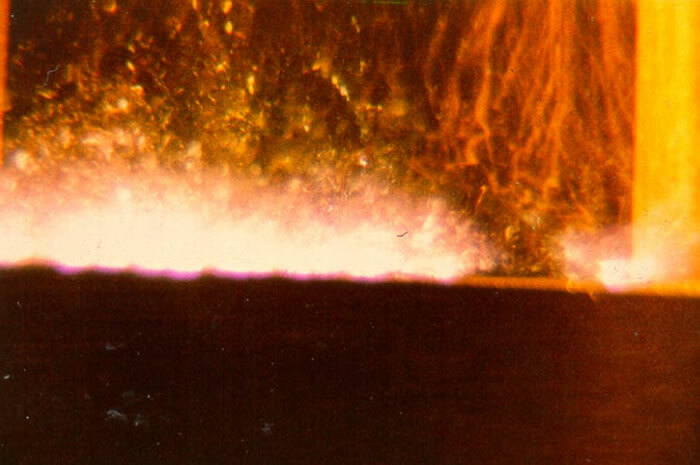 The molten metal is rapidly quenched by the dielectric. Microcracks can form in this very hard, brittle layer. If this layer is too thick or is not reduced or removed by polishing, the effects of this layer can cause premature failure of the part in some applications. The last layer is the heat affected zone or annealed layer, which has only been heated, not melted. 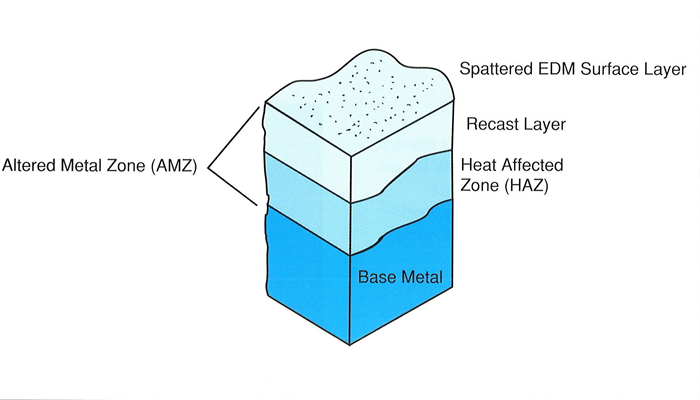 The depth of the recast layer and the heat affected zone is determined by the heat sinking ability of the material and the power used for the cut. This altered metal zone influences the quality of the surface integrity. Automatic finishing circuits available on CNC machines greatly reduce the recast layer, but do not eliminate the heat affected zone. Figure 2-4. Layers formed by EDM process.